Assuming the Mantle | Kris Johnson's Blog…sort of. ME: I think I may buy one of those MacBooks the pretentious douchebags like. BOB: Oh? Are you appropriately equipped to assume the mantle of pretentious douchebag? ME: Well, the MacBook comes with a coupon for a free soul patch and form-fitting black turtleneck, but I’m concerned that I don’t have the right body type for the turtleneck. BOB: How about a pair of hipster glasses and an ironic t-shirt? 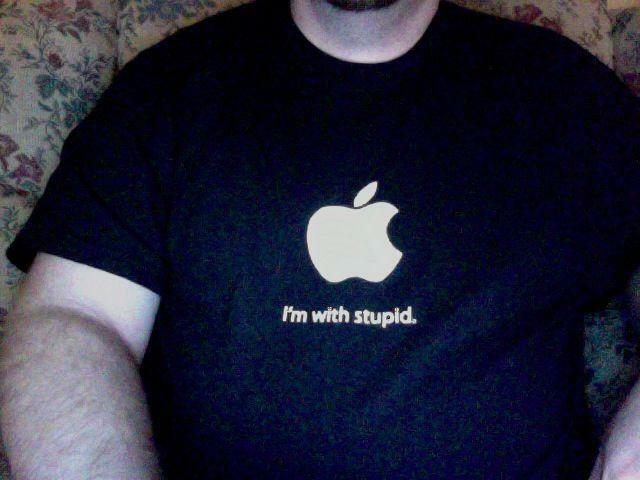 Alas, I can’t afford hipster glasses just now as…well, I recently purchased a MacBook; but I hope this t-shirt is sufficiently ironic. @blob — Impossible! I know for a fact that he doesn’t own a Mac!